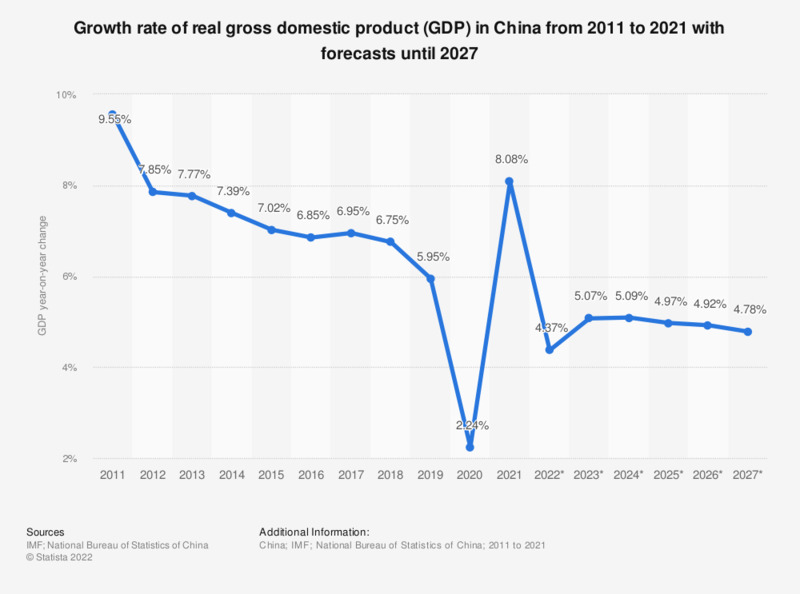 The graph shows the change in real gross domestic product (GDP) in China until 2017, with IMF forecasts until 2023. In 2017, China's real GDP change amounted to about 6.9 percent. The current gross domestic product is an important indicator of the economic strength of a country. It refers to the total market value of all goods and services that are produced within a country per year. When analyzing year-on-year changes, the current GDP is adjusted for inflation, thus making it constant. Real GDP growth is regarded as a key indicator for economic growth as it incorporates constant GDP figures. As of 2017, China was among the leading countries with the largest gross domestic product worldwide, second only to the United States which had a GDP volume of almost 19.5 trillion U.S. dollars. The Chinese GDP has shown remarkable growth over the past years. Upon closer examination of the distribution of GDP across economic sectors, a gradual shift from an economy heavily based on industrial production towards an economy focused on services becomes visible, with the service industry outpacing the manufacturing sector in terms of GDP contribution. Another key indicator for economic assessment is the balance of trade, which measures the relationship between imports and exports of a nation. As an economy heavily reliant on manufacturing and industrial production, China has reached a trade surplus over the last decade, with a total trade balance of around 421.4 billion U.S. dollars in 2017. Source does not provide an exact publication date. Date given is the day of data access.